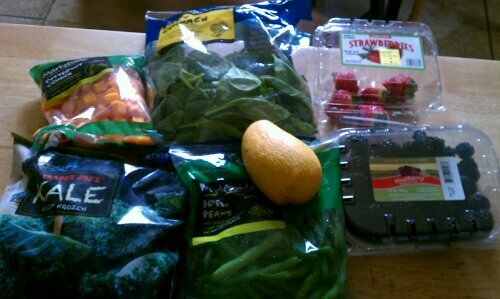 With spring in the air, cravings for fresh fruits and veggies enter my mind. I get excited for the garden and part of that excitment leads me to my local grocery stores produce aisle. The dogs benefit from my trips just as much as I do. The result are purees like my most recent Berry Veggy Puree Hearts. I’m moving further away from dried fruits and frozen veggies that make up the majority of my produce intake in the winter. I am still weening myself away from convenience food. It’s a slow process. Humans are creatures of habit and my habit is bad. 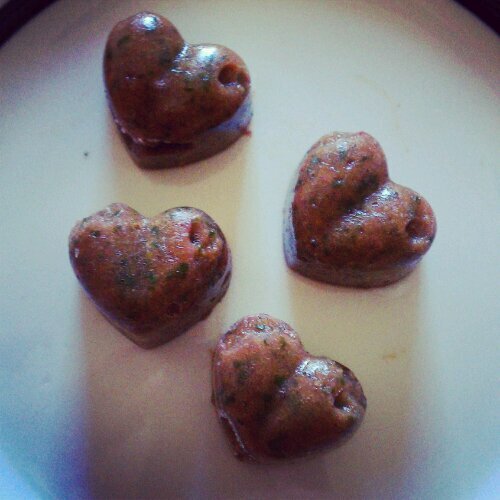 For the Berry Veggy Puree Hearts I used: 5 fresh strawberries 1 1/2 cups blackberries 1 package butternut squash, precut into cubes. 1 package green beans 2 handfuls Trader Joe’s frozen kale 1 big handful spinach 1 fresh champagne mango, which I peeled and removed the core 1/4 cup Apple cider vinegar I pureed all the ingredients in my food processor and the put into my heart shaped ice cube tray and froze portions for later use. Sweet, sweet Nectar of the Gods. Why you should add raw honey to your dog’s diet.